Whether running, biking or swimming, all aspects of a triathlon require a large amount of intense training and special preparation before you can compete effectively. Luckily, you don’t have to train without any help. There are an ever increasing number of triathlon watches that can help you train more effectively. 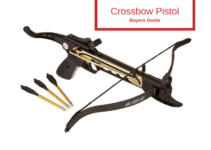 They can also be useful during the main event to help you navigate the course. A triathlon watch can be a useful tool for helping you with your training, aiding in navigation, recording stats, and can pack many other useful features as well. With the rapid rise in the popularity of triathlon watches, it may be hard to find the best one for your needs. That’s why we’ve compiled a list of the ten best triathlon watches, as well as a short review of each watch. 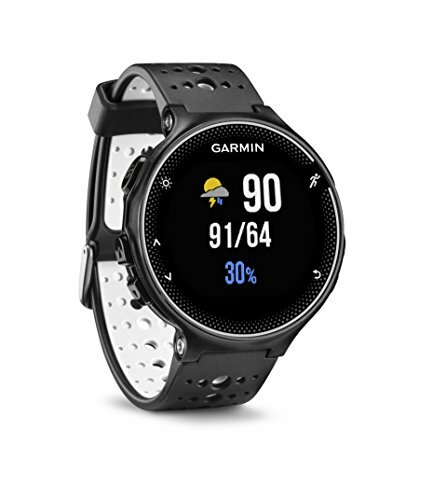 The Garmin Vivoactive Black is a high-end triathlon watch built with an extensive feature set and a high-resolution touchscreen display. Feature-wise, the Vivoactive Black is one of the absolute best, with built-in GPS, activity tracking and the ability to pair with a smartphone. In addition, there are a number of extra widgets, apps, and even watch faces available to download for free. 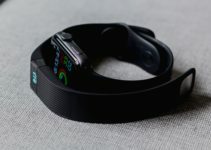 It has an impressive maximum battery life of three weeks, which is surprising for a GPS watch, especially with all of the extra features it packs. The watch also has numerous other features. 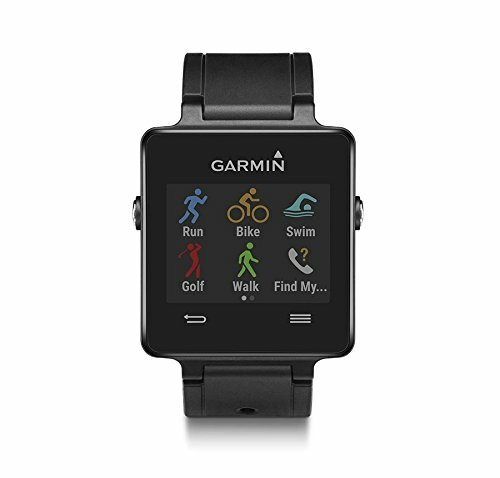 Such as activity tracking modes for various activities, including running, swimming, biking, walking and even golfing. On top of all of its great features, the watch’s face is also top-notch. The face has an ultra-thin color display that’s designed to be easily readable even in the sunlight. Overall, it’s a great high-quality triathlon watch with a lot of great features and an excellent battery life, but it is a bit on the pricey side. 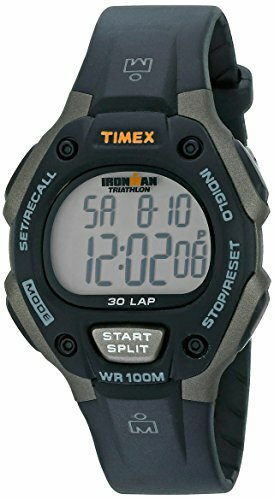 The Timex T5E901 Ironman triathlon watch is a more affordable option but is still loaded with useful features. The Ironman watch includes a one-hundred-hour chronograph with both lap and split options, a 99-lap counter, and memory recall for 30 laps. In addition, the watch allows you to use a number of customizable mode settings, as well as fifteen presets. The T5E901 also allows you to set up to three alarms, three different time zone settings and even offers a 24-hour timer. This Timex also sports a 6-year battery life. In addition, it has a display that’s designed to be easy to read whether it’s the dead of night or the middle of the afternoon. On top of that, the watch also sports a calendar that can record the day, date and month, and of course, it also tells the time. Overall, it’s an excellent watch, and is great for the price, however, it does lack a GPS system. 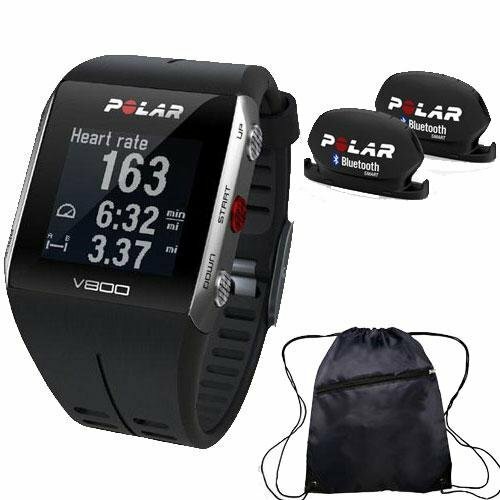 On the higher end of the spectrum, we have the Polar V800 GPS Sports Watch. The V800 is a GPS-enabled watch and training device for athletes. 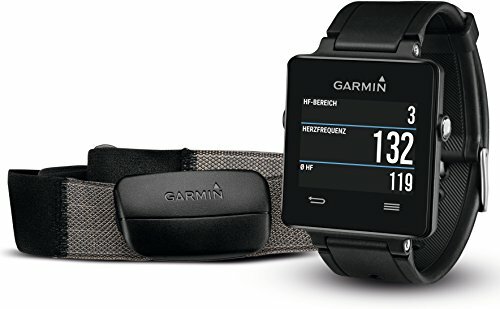 The watch includes numerous high-quality training and stat tracking features and you can also get a version of the watch with an included heart-rate monitor for added utility. The watch can track your route, distance, pace, altitude, and more. The watch can even sync with a smartphone app and website that lets you analyze your stats and plan your training. The V800’s Battery life is 14 hours when in training mode, and is 50 hours in low power mode. This is a bit more battery life than many other GPS-enabled watches, but a lot less than non-GPS watches. Overall, it’s a very high-quality watch and is great at its job. 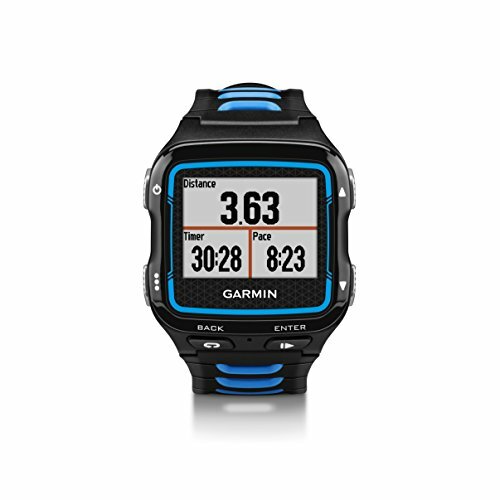 Another high-end option is the Garmin Forerunner 920XT, which is a high-quality GPS-enabled watch made to give you accurate stats and provide maximum utility. When using the version with a built-in heart rate monitor, the watch is able to estimate your recovery time and VO2 max. It’s also able to predict your race times for several preset distances. It can also estimate VO2 max for cycling when it’s used with a power meter. The watch can record your speed and distance, as well as other statistics, such as ascent and descent grade. The 920XT can also allow you to receive e-mails, text messages, and other alerts directly from a compatible smartphone. In addition, the watch allows for live tracking, so you can allow your friends and family to follow your route and statistics in real time. Overall, it’s a very good watch and is extremely reliable. 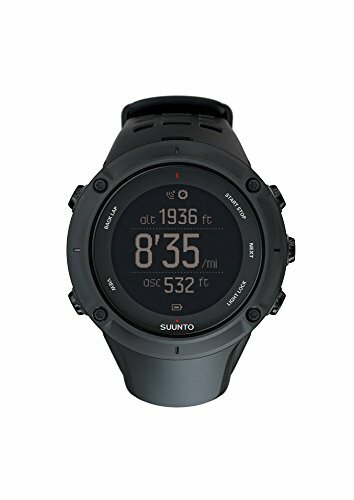 The Suunto Ambit3 Peak (with GPS & heart-rate monitor) is one of the highest rated triathlon watches available, but it’s also one of the most expensive. This specific model also includes a Suunto Ambit3 heart rate belt to supplement the watch. In addition, the Ambit3 Peak can track sunrise and sunset times, GPS data, and numerous other key variables. The watch also tracks your progress, whether you hike, swim, or run. On top of that, it allows you to connect to an iPhone or iPad with the free Suunto Movescount app. The app lets you create 3D map animations, customize your watch’s settings, keep track of GPS data, and analyze metrics and stats. As well as download apps for specific sports and of course, it keeps time. Overall, it’s a very high-quality triathlon watch and is extremely versatile. The 310XT is the waterproof equivalent of the 920XT. It’s waterproof up to 50 meters, so it’s completely safe for swimming usage. The watch includes features to make transitioning from swimming or running modes to bike mode simple and easy with its optional bike mount and quick release features. It can also track Multisport activities as a single workout so you never have to try to manually add together multi-sport workouts. The 310XT includes unique features that allow it to automatically transfer your workout data directly to your computer when it’s within range. You can also get their Training Center software if you want to be able to plan workouts on your computer and then send them directly to your 310X. Overall, it’s a perfect choice for someone who wants a high-quality waterproof triathlon watch with a lot of extra features. 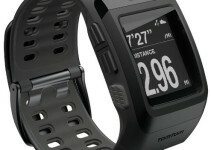 The TomTom Multisport GPS Watch is one of the cheaper triathlon watches available. The Multisport is versatile enough to handle almost anything, and it’s simple and easy to use interface makes it especially convenient. The watch utilizes vibration alerts rather than normal beeps like most watches. This means that you can still be notified loud environments or if you’re hearing impaired. 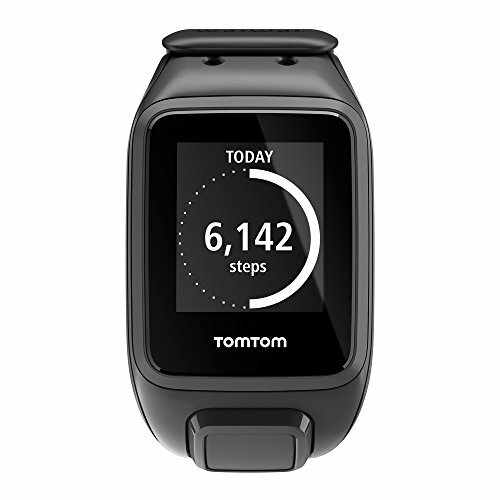 The TomTom Multisport watch can connect to your PC, allowing you to quickly and easily track your performance or share workouts. In addition, the watch supports custom goals, allowing you to easily track whether you’re on target with your workouts or not. Overall, this is a great watch if you want something that’s easy to use, convenient, and relatively inexpensive. Garmin’s Forerunner 230 triathlon watch is a less expensive alternative to their higher-end models. The watch features activity tracking similar to their other models, with vibration alert and step counting. In addition, the watch will automatically give you audio prompts that are received from a connected smartphone. The watch also notifies you about incoming e-mails, call alerts, calendar reminders, texts, and more. This watch has a larger screen than previous models, as well as a longer battery life. The battery will last up to 5 weeks in watch mode and 16 hours in training mode. Overall, this is a high-quality mid-range triathlon watch and performs its tasks well. 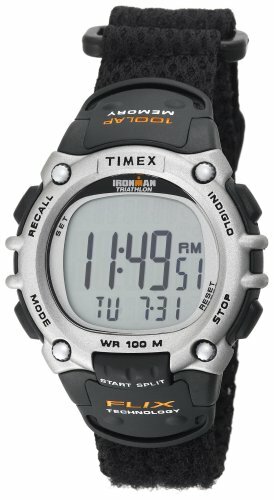 The Ironman T5E261 Flix 100 from Timex is Timex’ most popular triathlon watch. It’s similar in both price and function to the T5E901 but has a few key differences. The watch is water resistant to a depth of one hundred meters and has a sturdy acrylic crystal watch glass. The case’s screws are exposed for easy disassembly and repair, and the watch band is made of high-quality resin. The watch’s aesthetic design is significantly different from the T5E901. Overall, it’s a great watch and is inexpensive. It’s also relatively pleasing to look at. 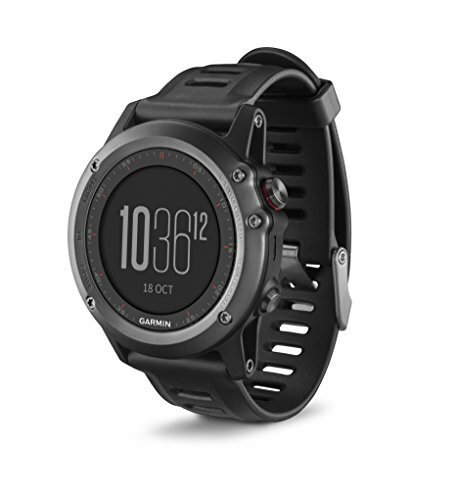 The Garmin Fenix 3 is a high-end triathlon watch for the people who will only settle for the best. As with many other sports watches, you can also purchase the watch with an optional heart rate monitor. The watch utilizes state of the art GPS systems and an omnidirectional EXO antenna for faster and more accurate location data. The battery is also significantly better than nearly anything else. Lasting up to 50 hours in UltraTrac mode and 6 weeks in watch mode. The display is a high-resolution, optically-bonded display that’s sunlight-visible. The Fenix 3 also utilizes Wi-Fi hotspots in order to automatically sync your stats with your software, allowing you to easily review your data. Overall, this is an excellent triathlon watch with an impressive battery life and high-tech features.